This article is about Ottoman designation. For southern part of the modern Arab Republic of Syria, see As-Suwayda Governorate. For the Southern part of Syrian opposition territories, see Southern Front (Syrian rebel group). For the newspaper, see Suriyya al-Janubiyya (newspaper). Southern Syria (سوريا الجنوبية, Suriyya al-Janubiyya) is the southern part of the Syria region, roughly corresponding to the Southern Levant. Typically it refers chronologically and geographically to the southern part of Ottoman Syria provinces. The term was used in Arabic primarily from 1918-20, during the Arab Kingdom of Syria period. Zachary Foster in his Princeton doctoral dissertation has written that, in the decades prior to World War I, the term “Southern Syria” was the least frequently used out of ten different ways to describe the region of Palestine in Arabic, noting that “it took me nearly a decade to find a handful of references”. 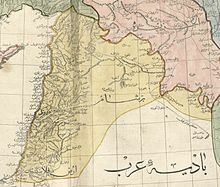 Throughout the Ottoman period, prior to World War I, the Levant was administered and viewed locally as one entity, divided into provinces. Geographically southern Syria included the southern sub-provinces of Ottoman Syria administrative region, including by the end of 19th and early 20th century the Mutasarrifate of Jerusalem, the Nablus Sanjak and Acre Sanjak (under Beirut Vilayet from 1888 and previously under Syria Vilayet), and a short-lived Mutasarrıfate of Karak (split as a new administrative unit from Syria Vilayet in 1894/5). In 1884, the governor of Damascus proposed the establishment of a new Vilayet in southern Syria, composed of the regions of Jerusalem, Balqa' and Ma'an though nothing came out of this. At the start of Faisal’s reign in the Arab Kingdom of Syria, the term Southern Syria became synonymous with Palestine. After 1918 it would take on an increased political significance as a way of rejecting the separation of the British Mandate from Syria. In early 20th century, the term "Southern Syria" could imply support for the Greater Syria nationalism associated with the kingdom promised to the Hashemite dynasty of the Hejaz by the British during World War I. After the war, the Hashemite prince Faisal attempted to establish such a Greater Syrian or pan-Mashriq state—a united kingdom that would comprise all of what eventually became Syria, Lebanon, Israel, Jordan, and Palestine, but he was stymied by conflicting promises made by the British to different parties (see Sykes–Picot Agreement), leading to the French creation of the mandate of Syria and Lebanon in 1920. "Colonel Symes explained that the country was described as 'Palestine' by Europeans and as 'Falestin' by the Arabs. The Hebrew name for the country was the designation 'Land of Israel', and the Government, to meet Jewish wishes, had agreed that the word "Palestine" in Hebrew characters should be followed in all official documents by the initials which stood for that designation. As a set-off to this, certain of the Arab politicians suggested that the country should be called 'Southern Syria' in order to emphasize its close relation with another Arab State". In 1932, an Arab party named "the Arab Independence Party in Southern Syria" was established in Mandatory Palestine to emphasize the reaffirmed support for Arab pan-Syrianism. ^ Kazziha, Walid. The Social History of the Southern Syria (Trans-Jordan) in the 19th and Early 20th Century. Beirut Arab University. 1972. ^ Benny Morris, Righteous Victims, pages 35-36. ^ Foster, Zachary (November 2017). "Southern Syria". The Invention of Palestine (thesis). Princeton University. pp. 20–21. ISBN 9780355480238. Docket 10634618. Retrieved 9 February 2018. The Arabs described “the area that became Israel,” as Meir put it, in at least ten different ways in the decades prior to World War I, roughly in this order of frequency: Palestine; Syria; Sham; the Holy Land; the Land of Jerusalem; the District of Jerusalem + the District of Balqa + the District of Acre; southern Sham; the southern part of Sham; the Land of Jerusalem + the land of Gaza + the land of Ramla + the land of Nablus + the land of Haifa + the land of Hebron (i.e. cities were used, not regions); “the southern part of Syria, Palestine”; and southern Syria. The Arabic term “southern Syria” so rarely appeared in Arabic sources before 1918 that I’ve included every reference to the phrase I’ve ever come across in the footnote at the end of this paragraph (it did appear more often in Western languages). Golda Meir, Mikhaʼel Asaf and my Shabbat hosts were right about Southern Syria, but by focusing only on the facts that supported their arguments and ignoring all the others, they got the story completely wrong. They used facts to obscure the history. If the term rarely appeared in Arabic before World War I, how do propagandists even know it existed? Before World War I, they don’t. It took me nearly a decade to find a handful of references, and I can assure you few if any propagandists are familiar with its Arabic usage before 1918. But that changed dramatically in 1918, when the term gained traction for a couple of years until 1920. That’s because the Hijazi nobleman Faysal revolted against the Ottoman Empire in 1916 during the First World War (alongside “Lawrence of Arabia”), and established an Arab Kingdom in Damascus in 1918 which he ruled until the French violently overthrew him in 1920. During his period of rule, many Arabs in Palestine thought naively that if they could convince Palestine’s British conquerors the land had always been part of Syria—indeed, that it was even called “southern Syria”—then Britain might withdraw its troops from the region and hand Palestine over to Faysal. This led some folks to start calling the place southern Syria. The decision was born out of the preference of some of Palestine’s Arabs to live under Arab rule from Damascus rather than under British rule from Jerusalem—the same British who, only a few months earlier, in 1917, had declared in the Balfour Declaration their intention to make a national home for the Jews in Palestine. ^ Rogan, Eugene L. (11 April 2002). Frontiers of the State in the Late Ottoman Empire: Transjordan, 1850-1921. Cambridge University Press. pp. 52–55. ISBN 978-0-521-89223-0. Retrieved 10 June 2013. ^ Salim Tamari (2017). The Great War and the Remaking of Palestine. Univ of California Press. p. 3. Al-Fatat became a leading force in the establishment of the First Syrian government under Prince Faisal. It was during this period that the term Southern Syria became synonymous with Palestine, but the expression gained an added political significance after 1918 - for example, in the creation of Aref and Dajani's newspaper, Surya al-janubiyya, signaling the unity of Jerusalem with Damascus, in response to the British-Zionist schemes of separating Palestine from Syria. In other words, the term Southern Syria, which so far had been a geographic designation, was now explicitly used instead for Palestine as a reaction to the attempts by the British Mandate authorities to excise Palestine from Syria. ^ Pipes, D. Greater Syria: The History of an Ambition. Oxford University Press. 1990. p.69. This page was last edited on 17 March 2019, at 07:22 (UTC).